These DropDown Menu Types are ideal for situations where the selection from one dropdown will narrow the search for another dropdown menu. An example of this is a page that has a dropdown menu for Countries, States-Provinces, and Cities. When you choose a Country then it will narrow the list of States-Provinces in this dropdown menu. Next when you choose a State-Province then this will narrow the list of Cities. In order to use this feature you will be selecting pairs of dropdown menus that you would like to chain together. If you require say three chained menus like the example above then you would first choose the Country / State-Province pair and then State-Province / City pair. 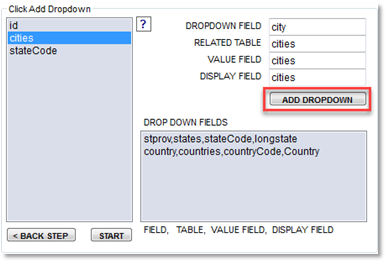 In order to build a Chained DropDown Menus you will first need to build the normal DropDown on the DropDowns tab and then once you have created all DropDowns then click on the Chained DropDowns tab to build Chained DropDown Menu pairs. 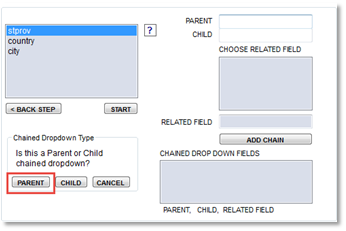 When you begin by selecting the first item to add as a chained dropdown menu you will be asked if this is the Parent or Child. In our example below state/province field will become the parent followed by city becoming the child. 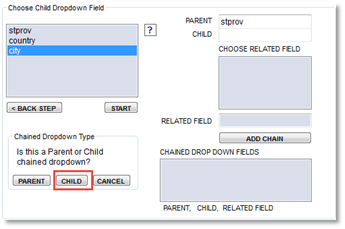 The final step will require that you choose a field from the Child DropDown Menus table that relates back to the Parent DropDown Menus table. In this example the field is called stateCode that contains text values such as CA for California, NM for New Mexico, TX for Texas, CA OR for Oregon, etc. Once you have filled in the 3 required fields then click on the Add Chained DropDown button.